The traditional Kyrgyz dish Besh barmak is eaten with the hands, thereby its name besh barmak – “five fingers”. The classic variant of the dish is nowadays eaten in the Talas region of northern Kyrgyzstan. Fresh dough is cut into squares and boiled in a meat broth. Often a broth with boiled brains is added, especially if the meat is from a freshly slaughtered ram. Sometimes, however, beef and even horsemeat can be used as the basic ingredient. When serving Besh barmak the head of the sheep will be given to the most honoured guest. Wash the meat in running water. Put it in a saucepan with cold water and bring to a boil. When the water starts boiling, remove the foam on the surface and boil for about 1.5 hours. When the meat is cooked let it cool before cutting it into small slices or strips 0.5-6 cm. Put the cut meat in a separate dish and keep it covered in a warm place. While the meat is boiling, prepare the dough. Pour the water into a bowl, add egg and salt while stirring. Add the flour and knead the dough. The ready dough should be divided into two equal parts and placed for 10-15 minutes under a dish. This procedure makes it soft and pliable for rolling. Make those 2 parts into a bun which is then flattened by pressing down on it. Keep covered with a linen cloth and left for 15 minutes. Roll each bun to a thickness of about 2-3 mm. Fold the dough into a roll and cut across into the form of noodles about 3-4 mm wide. Lower the noodles into the boiling mutton broth (after having taken off the meat). When the noodles float to the surface, stir the pot and simmer for another minute. Remove the noodles from the pot, let them drain and place them onto a dish. Cut two of the onions into rings and put in the boiling lamb broth for 1 minute. Remove from the broth and put an even layer of onions on the noodles. Place the strips of meat in the form of a small hill in the middle of the rings of onions. Then prepare the Chyk sauce. Finely chop the third onion. Pour 0.5 l of broth in an pot and bring to boil. Add the chopped onions, black pepper and salt to taste. The Chyk should be hot when served with the meat and the noodles, so it is necessary to cover it and store it in a warm place in order to avoid it cooling. In the remaining broth, add the bay leaf and salt, boil 5 minutes. Fill the four serving bowls, and sprinkle with dill. When serving, pour the Chyk sauce over the large platter with the meat and the noodles. The dish with noodles and meat is placed on the middle of the table and each person is served a bowl of broth. Julie Sapaeva was born and raised in Kyrgyzstan. She has been cooking since her childhood, when she started helping her mother in the kitchen. Julie likes to experiment different combinationsof ingredients and is very satisfied when people enjoy eating her food. 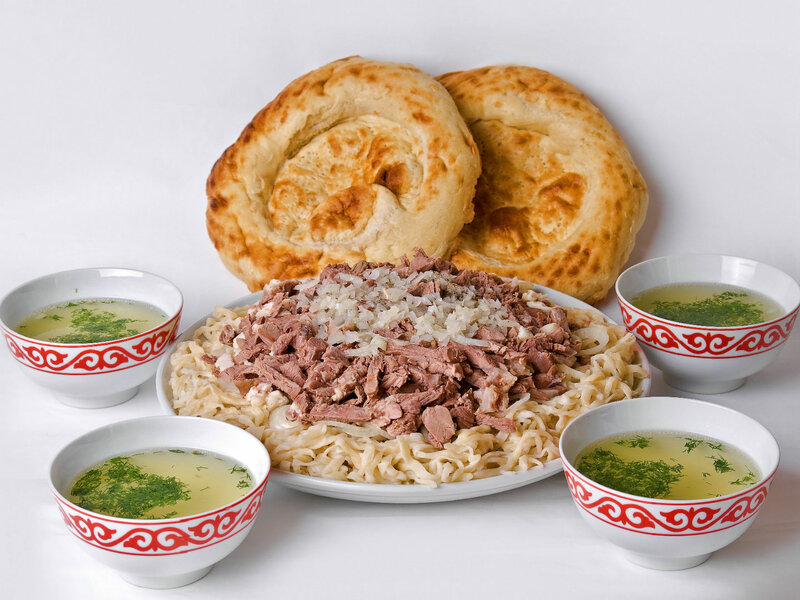 Traditional Kyrgyz foodrevolves around mutton and horse meat, as well as various dairy products. The cooking techniques and major ingredients have been strongly influenced by the nomadic way of life. Fish, especially from the rivers and Lake Issyk Kul, is also highly favoured food.